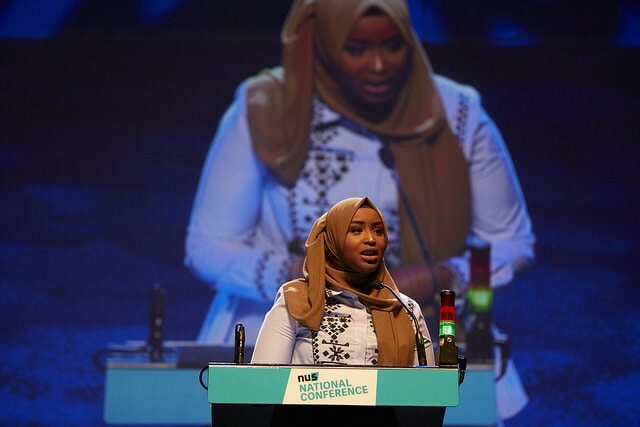 The Muslim Association of Britain would like to congratulate Zamzam Ibrahim, the newly elected President of the National Union of Students (NUS), who steps into the role at a challenging time for students everywhere. Having served as Vice President of Society & Citizenship, Ibrahim will now represent over 7 million students across the UK. Ibrahim’s track record and incredible dedication has been an inspiration to many and has paved the way for students from all backgrounds to become involved in student politics and make a difference. Her strong efforts standing shoulder to shoulder with Muslim students, in issues ranging from campaigning against Islamophobic attacks to improving the student experience, have had a memorable and noticeable impact, and we look forward to seeing what she will continue to achieve in her remit as President. MAB also welcomes the motion that was passed which now mandates NUS to formally adopt the definition of Islamophobia as proposed by the All-Party Parliamentary Group (APPG) on British Muslims. In light of the overwhelming acknowledgment that Islamophobia, anti-Muslim hatred and discrimination against Muslims are among the catalysts to the recent massacre of 51 worshippers in two mosques in Christchurch, New Zealand, this move must be regarded as a step in the right direction. Muslim Association of Britain (MAB) is a UK organisation founded in 1997, dedicated to serving society by promoting the accepted understanding of Islam with its spiritual teachings, ideals, civil concepts and moral values, all directed towards serving humanity. MAB has become a platform where strong Muslim individuals can unite. It also has built a strong Muslim community through educational, social, spiritual and political programs (1,000,000 man march for Iraq). It has become a strong voice for British Muslims.